Introducing the first DOCSIS 3.1 cable modem in the SURFboard lineup. 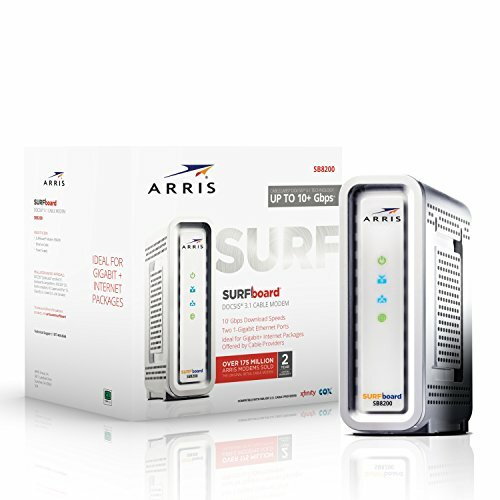 The SURFboard SB8200 is a DOCSIS 3.1 modem – the newest technology being offered by cable providers. It is capable of the fastest speeds available by cable Internet service providers, perfect for things like 4K Ultra-HD Video Streaming and Virtual Reality Gaming. Plus, it has 2 Gigabit Ethernet ports! The SB8200 is compatible with major US Cable providers like Comcast (Xfinity service by Comcast) Cox, and others. Today’s connected home demands speeds far more powerful than ever. Power your home network with the SB8200 and get the fastest speeds and most reliable connection to the Internet. Own yours today and stop paying rental fees. Comcast Xfinity and Cox Cable APPROVED! Spectrum (Charter, Time Warner and Brighthouse) and others pending approval. DOCSIS 3.1 cable modem, the newest technology being offered by Cable Internet Providers. Backward compatible with DOCSIS 3.0. 32 DOWNLOAD and 8 UPLOAD Channels. BEST for 300 Mbps Internet plans and above! Perfect for streaming 4K HD video and online gaming.